Wood lattice panels are a great way to update the look of wine cabinets, closet storage and accent doors throughout your home and in your garden. Naturtrend stocks sanded and ready to finish lattice style door inserts in high quality. Radiator coverings, wood lattice panels in standard dimensions (65cm x 125cm). 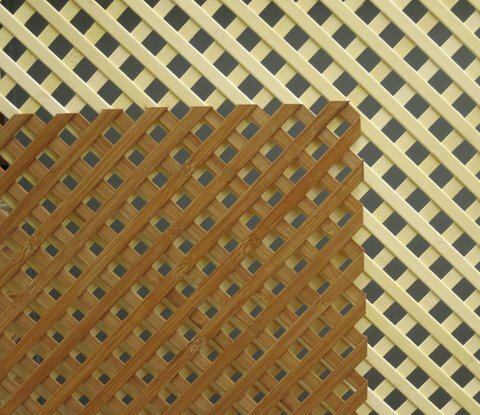 This product has various names: wooden lattice grille, mission trellis, wooden grid panel etc. 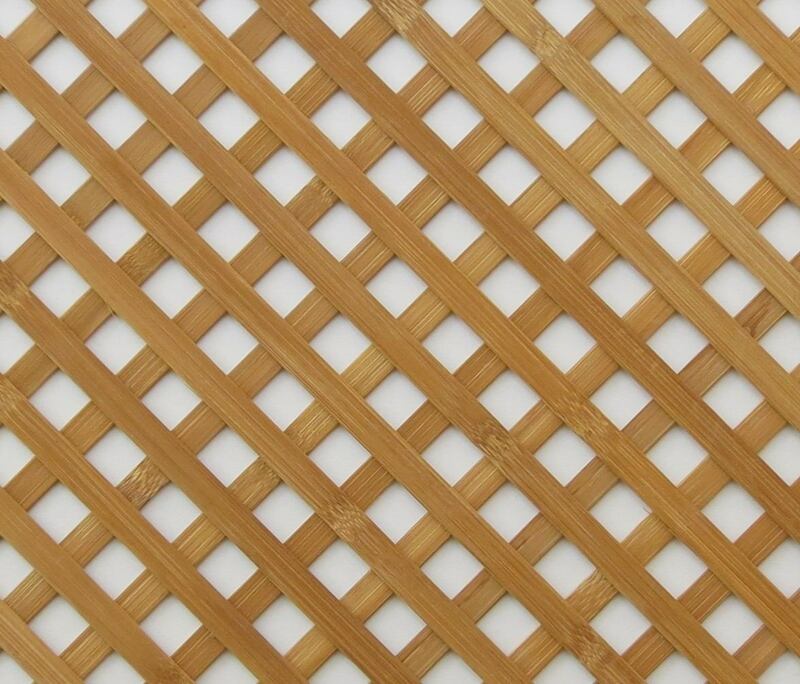 Our wooden lattice panels are available in two colours, a light (linden tree colour) and a dark brown (oak colour). Both shades are fine grain without a dominant pattern. As it is supplied in its natural form it can be stained, waxed, lacquered, varnished or even painted at will. The wicker rods are glued to each joining point with an invisible adhesive. Both sides of the wooden lattice panels are equally elaborated and decorative which makes it easier to use. 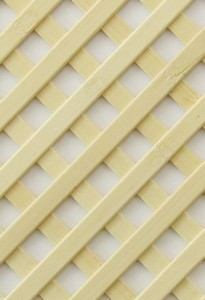 We make lattice grille of an exotic hardwood material called Exota-wood. This is a light and at the same time very hard substance, that behaves exactly like any hardwood in terms of lacquering and painting. It is the perfect raw material, because has no dominant grain pattern. Neither of our wooden lattice grille panels are painted, what you can see in the pictures is the natural colour of the hardwood material. The rods are 11mm wide x 2mm thick, with an inclination of 45° the hole size of the grid is 14mm. The overall thickness is 4mm. 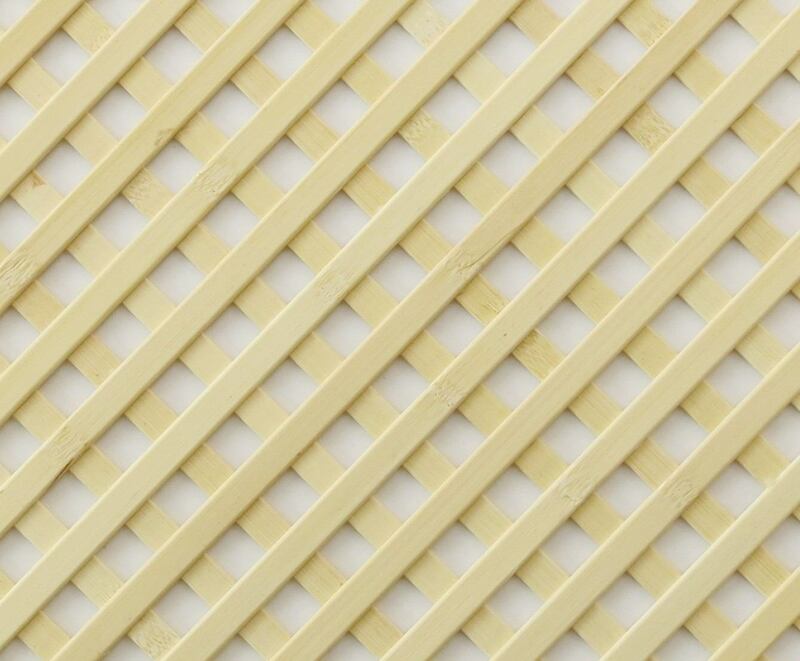 The standard size of a wooden lattice grille panel is 65cm x 125cm. You can order uniquely made, custom sized wooden lattice grille panels to a maximum of 65cm x 250cm. All price is gross, include the VAT (Value Added Taxes)! 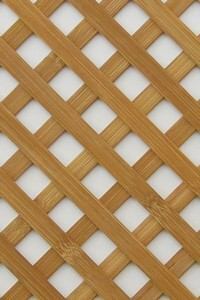 We make custom size lattice panels from hardwood after a previous agreement only. The shipping of a custom made wooden lattice grille panel is about 1–2 weeks. Regardless, in terms of shipping please, check with us before ordering to calculate an exact the lead time. Due to possible damage caused by the transportation, to every lattice panel, we pack with an OSB (Oriented Strand Board) sheet without any additional cost. To make certain of the quality of our product please, ask for a free, 10cm x 10cm sample. We deliver samples free of charge within the European Union. All displayed prices mean the gross retail value, VAT (Value Added Taxes) included. If you are a reseller, joiner, or interior designer and/or if you would buy large quantities please, contact us for an even more favourable price! The shipping via parcel post is very economical in Europe, but our prices are also favourable for those who order from outside of the EU. For more information please, read our detailed catalogue. Below you can read some suggestions about how to the use a Wood Lattice Grille (a. k. a. Mission Trellis, Wooden Trellis and Arbours and Wooden Lattice Panel) made of hardwood. Wood lattice panels are a great way to update the look of closet storage, accent doors and to cover up an unfavourable radiator/heater, a framed lattice can also be applied as an indoor/outdoor space divider. A wooden trellis is extensively useful where the ventilation is important. Since the air is not sealed behind the trellis panels they are perfect for door inserts (e. g. in a wardrobe). Our wooden trellises are lightweight, so you can apply them to sliding doors, sliding wardrobe doors or even in kitchen cupboard doors. 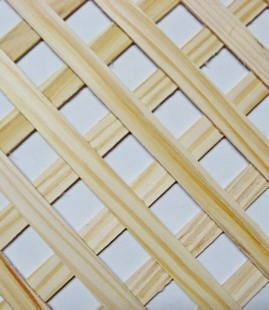 Naturtrend stocks high-quality wooden lattice grille. Both of its sides are well-wrought, sanded and ready to use. 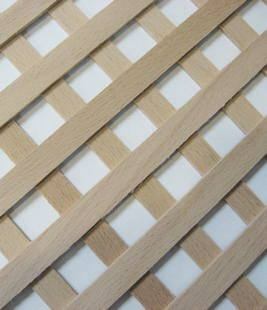 In the process of manufacturing wooden lattice grille, its rods are sanded before and after sticking them together. Finally, the wood trellis panel is polished by laser-controlled grinding machine. It can be lacquered and painted right away, no further surface treatment is needed. Every price is retail gross price (include VAT). If you a reseller, joiner, or interior designer and you buy larger amount we can give you a discount price. Please, contact us!